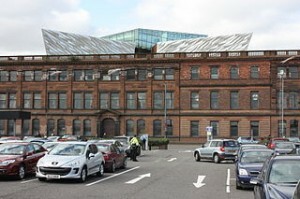 The Belfast Telegraph reports that the former headquarters of Harland & Wolff is being turned into a new business hub. An architectural firm has already moved in on the second floor of the three story sandstone building built in stages between 1909 and 1919. The Duke of York has visited the spot where the Titanic was built during a tour in Belfast. Prince Andrew viewed the cavernous dry dock in which the liner, which sank with the loss of more than 1,000 people, was prepared for sea. Okay I admit this is filler since hardly anyone except palace watchers will care about his. At least this as nothing to do with a certain reality star whose initials are K.K., a crazed Lohan, or whether or not two judges on American Idol hate each other.